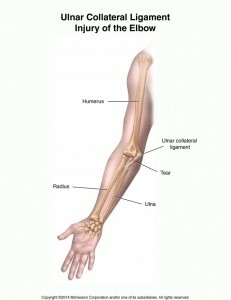 Ulnar collateral ligament injury of the elbow is a sprain (tear) of one of the ligaments on the inner side of the elbow. The ulnar collateral ligament (UCL) is a structure that helps keep the normal relationship of the upper arm bone (humerus) and the one of the forearm bones (ulna). This ligament is injured in throwing types of sports or after elbow dislocation or surgery. It may occur as a sudden tear or may gradually stretch out over time with repetitive injury. This ligament is rarely stressed in daily activities. It prevents the elbow from gapping apart on the inner side. When torn, this ligament usually does not heal or may heal loose in a lengthened position. Sprains are classified into three grades. In a first-degree sprain, the ligament is not lengthened but is painful. With a second-degree sprain, the ligament is stretched but still functions. With a third-degree sprain, the ligament is torn and does not function. Ulnar collateral ligament injury is caused by a force that exceeds the strength of the ligament. This injury usually is the result of throwing repetitively or particularly hard. It may occur with an elbow dislocation or as a result of surgery.